The Coyotes let their swimming and diving talents do the talking this past Friday and Saturday. The women’s swim team hit the water facing-off against Minnesota State at Highland Pool. First-year Colorado native Quinn Fawcett started her collegiate career off with a bang, winning the 200-yard freestyle by two seconds over first-year Chelsea Calhoon, finishing with a time of 1:57.55. Fawcett also went on to win the 500-yard freestyle in a time of 5:20.33. 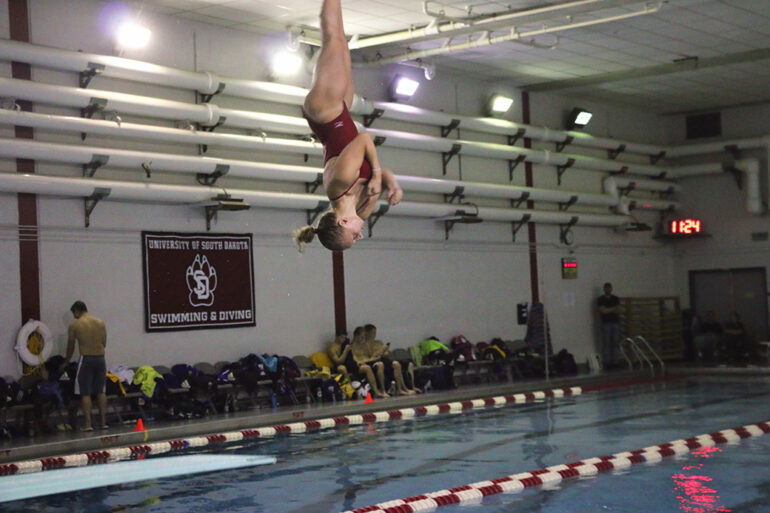 Junior Greysen Hertting swept the diving events, scoring 267.20 in the one-meter dive and 311.20 in the three-meter. And with little-to-no rest, the women’s swim and dive team packed up their stuff and headed back to Vermillion to take on Western Illinois in the DakotaDome, where they’d be accompanied by the men’s swim and dive team. First-year Theresa Godlewski started the meet off by putting the USD swim team in good positioning in the 200-meter medley relay, first-year Erin Kleiner then finished it off with a split of 27.85, putting the USD women at the top of the leaderboards. First-year Hannah Gupton won the 100-meter butterfly with a time of 1:08.40. Junior Allie Pfauth won the 400-meter individual medley with a time of 5:17.82. Junior Greysen Hertting swept the diving events yet again, scoring 267.75 in the one-meter and a score of 234.60 in the three-meter, scoring a combined 22 points in two events. First-year Quinn Fawcett took to the waters of the DakotaDome for the second time of her collegiate career and won the 200-meter freestyle with a time of 2:13.02, scoring 11 points for the team. Hertting’s and Fawcett’s combined Friday and Saturday performances ultimately earned Hertting the Summit League Diver of the Week honor. Fawcett received the Summit Leagues Swimmer of the Week. On the men’s side, first-year California native Hunter Padgett led the way, breaking the 400-meter school record with a time of 4:11.42, a record that had not been touched since 1996. Padgett later won the 200-meter freestyle with a time of 1:57.68. Senior Chase Testa took control of the dive events, winning the one-meter dive with a score of 253.95, and the three-meter with a score of 260.18. Both Padgett and Testa’s dominating performances earned them both Summit League Swimmer and Diver of the Week awards. After two days of meets, with the women crushing Minnesota State and the men and women both shutting out Western Illinois, the Coyotes lead a sweep in the Summit League’s weekly individual awards. The men will look to continue their run Nov. 6 in Ames, Iowa, while the women will hope to top the leaderboards come Oct. 22 for a home meet at the DakotaDome.